Our Father Saint Benedict knew well that an abbot, even with the best intentions, may find himself “too solicitous for fleeting, earthly, and perishable things” and distracted from “the salvation of the souls entrusted to him.” The Father Cellarer may suffer the same sort of temptations. The abbot and the cellarer both are to give to all the brethren an example of unwavering trust in Divine Providence. When the abbot and his closest collaborators are shaken in their confidence in Divine Providence, the whole community becomes insecure and suffers anxiety. Not for nothing do we pray the Litany of Divine Providence each day. The words of Lord in the Sermon on the Mount shine through today’s portion of the Holy Rule. Come to Me with every question, doubt, and fear, and I will answer you out of the tenderness and wisdom of My Heart. This work will be done according to My design, for I have organized all things in My wisdom, and it remains only for My plan to unfold. You are but an instrument in My pierced hands. Allow Me to use you as I see fit. Above all, be faithful to the adoration I have asked of you. It is by adoration that My monastery will be built, and it is by adoration that I will cleanse and heal and sanctify My priests, the priests whom My Heart loves with an everlasting love. You all know that I do not often quote from the notebooks in Chapter. All the same, it is striking that this particular passage so clearly says that “every question, doubt, and fear” is to be brought to Our Lord and, I would say, left at His feet. Our life of adoration is what is essential. If we are faithful to this, “preferring nothing to the Work of God,” as Saint Benedict says in Chapter XLIII, then will Our Lord do all the rest, even as He promised. I am astonished and humbled to the ground every time I open the notebooks and discover that things that were intimated to me in prayer ten, eleven, and twelve years ago have to come to pass just as written. 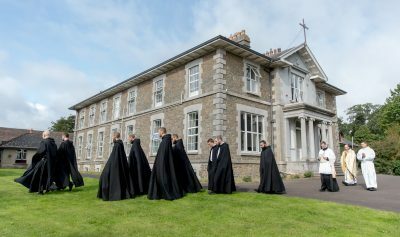 Everything here, from the acquisition of the property, the growth of the monastery, and the spiritual hospitality offered to priests, attests to the faithfulness of Our Lord and to the bounties of His Providence. When, as happened last evening, I find myself in the Oratory, before the Blessed Sacrament exposed, and I look around and see so many of you there in adoration, not by any compulsion, but spontaneously and gratuitously, and in response to Our Lord’s requests for adoration and reparation, I marvel at all that He has done here in us and among us. Our monastery is so manifestly Our Lord’s work that to doubt of what He has done in the past and will surely do in days and years to would betray a want of faith and of gratitude. Our Lord could not have chosen weaker or more defective instruments, but He did this in order demonstrate to the eyes of all that what is happening here is entirely His work.